Education is at the forefront of almost every campaign. With San Pedro offering so much to the business community, it is admirable when one of such organizations gives back. Scotia Bank is one of such businesses that has decided to do just that, and in a rather big way. 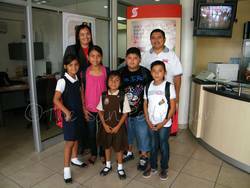 On Friday June 17th, Luis Gutierrez, Branch Manager of the San Pedro Scotia Bank Office, presented five grants of $300 each to five students from the various primary schools on the island. Receiving the grants, along with their parents or guardians were: Litzy Baeza, San Pedro RC School; Kris Medrano, New Horizon SDA; Jennifer Hernandez, New Horizon SDA; Analuisa Sanchez, New Horizon SDA and Eleida Coc of Holy Cross Anglican. Along with the grants, the students received a Scotia Bank back pack containing school supplies. According to Mr. Gutierrez, this effort is in conjunction with Scotia Bank's Bright Future Program, "Under Scotia Bank's Bright Future Program, we have various community projects that are realized and the educational grant for primary schools is just one of the major accomplishments. We have managed to create this fund on a yearly basis for students across the country. Each year the smaller branches gear up to give a minimum to five grants, however, the bigger branches extend up to ten or 15 grants yearly. The yearly branch budget for this project is $1500 - $2000. The funds are created through fund raising efforts by the local branch offices. Here in San Pedro, we raise funds as you noticed from bake sales, bar-b-q sales. All funds collected, our bank matches these funds to keep the program going, and they double the funds each year". Gutierrez further informed that this is not the only project that the bank is undertaking as there will be other projects launched momentarily. The grants or scholarships are available to students from the various schools here on the island. When being considered, each student's individual academic performance is taken into considering, with the required average being an (85%) average. Apart from academic performance, the family's financial situation is taken into consideration, as the assistance is geared to students that are in most need. As part of the application process, the student is required to write an essay, expressing the reasons why he/she should be the successful applicant for the grants. Applications are accepted commencing the beginning of May each year and may be acquired from the school's office. The deadline for applications is the second week in June. This year, there were twelve applications received but unfortunately, only five grants were available. However, while all students did not receive a grant, they all received a gift form Scotia Bank - a Scotia Bank backpack containing school supplies. Scotia Bank can be contacted for further information by calling 226-3730.